Shirts With Random Triangles: Atlanta Falcons launch website for new out-of-this-world stadium. 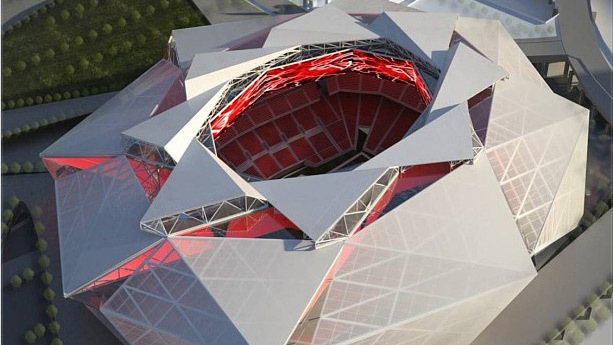 Atlanta Falcons launch website for new out-of-this-world stadium. The Atlanta Falcons have unveiled a website for the team's future home on Wednesday. The design for the new stadium, which is expected to also be the site for the SEC championship game, the Chick-fil-A Kickoff game, and the Chick-fil-A Bowl was given final approval by Georgia World Congress Center Authority's Stadium Development Committee on Tuesday. The new stadium is also which is expected to also be the site for the SEC championship game, the Chick-fil-A Kickoff game, and the Chick-fil-A Bowl. The new stadium design has become notable for its retractable roof, which resembles either a) a blooming flower, b) the mouth of a Sandworm from Dune, or c) what exactly you think it looks like, pervert. It will certainly be a unique addition to the Atlanta landscape. The stadium is scheduled to be completed in time for the Falcons' 2017 season. In that year, Falcons' wide receiver Julio Jones will be 28, quarterback Matt Ryan will be 32, and the Atlanta Hawks will still not have gotten past the first round of the NBA Playoffs.